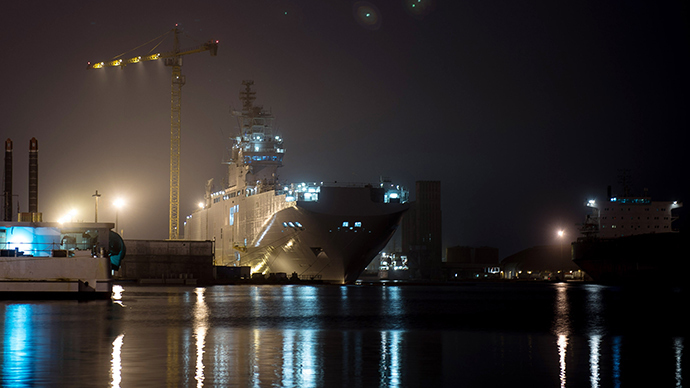 Russia won’t try and get its ill-fated Mistral helicopter carriers from France, a Russian official has announced. Moscow and Paris are set to discuss damages to be paid by France for welching on the deal. “Russia won’t be taking them [the Mistral vessels]. That’s a fact. There’s just a single discussion underway at the moment – on the amount of money that should be returned to Russia,” Oleg Bochkarev, a deputy chairman of the Russian governmental Military-Industrial Commission, is cited as saying by RBC. The negotiations have been “transferred into the commercial field” and “major efforts are being made today” for Russia to receive damages, Bochkarev told RIA Novosti. France reportedly offered €748 million as compensation, but Russia turned down the proposal, calling it "laughable." The official also said that Russia would build its own helicopter carriers, in place of the Mistral warships, which Paris refused to supply Moscow. Russia and France signed a €1.12 billion contract to build two Mistral class amphibious ships in 2011. Under the deal, Russia was supposed to receive the first of the two Mistral-class helicopter carriers, the Vladivostok, in October 2014 and the second, the Sevastopol, in 2015. But the mood in Paris went through a sea change. In mid-2014, the French side postponed delivery indefinitely due to pressure from the US and the EU, which have imposed a set of sanctions against Moscow over the accession of Crimea and Russia’s alleged involvement in the Ukrainian crisis. Earlier this month, an article in the Le Point weekly magazine said the French government could end up having to pay “between €2 billion and €5 billion,” if it doesn’t fulfill its contractual obligations with Russia. The French Navy repeatedly stated that it doesn’t need the Mistrals as they are built according to Russian standards. Reports have emerged that the cheapest solution for France would be to scuttle the two newly-built ships as maintaining them costs an estimated €2 to €5 million every month.